There are two lists below. One by row for family or couple last name in alpha order and the other by class year. For the latter this will be the year of joining CMC Vellore as an under graduate student (Allied Health Sciences, Medical or Nursing Colleges). Many of us know Mary Oommen, daughter of the former Head of Chaplaincy Department, the Late Rev. A C Oommen. Mary (or Shanthi as she was known in the campus) is from the MBBS batch of 1973. Some also know her husband, Rajkumar Ramasamy through his long association with the Christian Fellowship Hospital, Oddanchathiram. We are about to know much more about them and their awe inspiring work in a small village in Tamil Nadu. Be prepared to be amazed and touched by their unparalleled zeal, untiring spirits and incredible professional stamina. We are extremely proud of their work and as alumni of CMC Vellore we can draw from their motivation and faith in God that manifests in service to the underserved, armed with nothing but Divine love. Mary was the recipient of the prestigeous Paul Harrison award and it is a tribute to the Oommens that brother Johny was also thus honoured. The GOTC has a huge tradition of being an event that celebrates the alma mater and the bonds that brought the alumni together in life long friendships. Over time, the flavour of being grateful, appreciative and supportive of fellow alumni that have dedicated themselves to a life time of selfless service has come to be recognized. Mary and Raj follow many others who have been with us and shared their stories and have left us spellbound but stirred, sometimes into some inspired action. May that good feeling prevail! 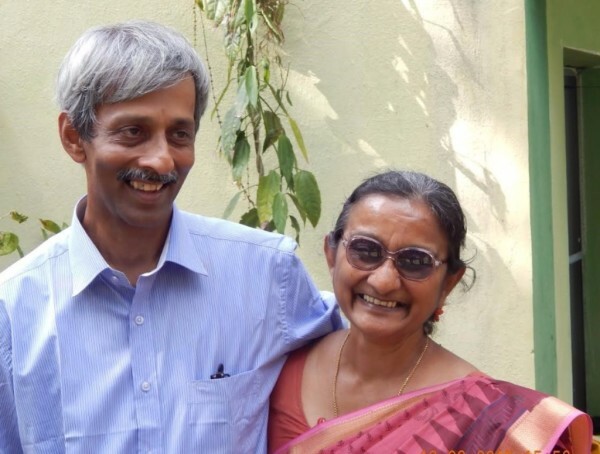 Raj and Mary Ramasamy, live and work at Kizhakuchettiarpatty (K C Patty), Primary Health centre which is based in a small relatively remote village in the Lower Kodaikanal Hills in Tamil Nadu. They, along with a team of one staff nurse and ten Health workers serve to provide Primary Health Care to a population of about 17,000. Their target group is the Adivasi (indigenous) community and the lower socioeconomic population living in the hills. They are the only qualified medical care providers for about a forty KM radius. Of the 17,000 who access the health centre here in K C Patty or the subcentre at Pachalur 10km away, about 6000 are covered by home and village visits. Raj has been working there for 28 years while Mary joined him in 2009 after working at the Christian Fellowship Hospital, Oddanchathiram for 25 years. God bess them in their exemplary work reflecting the mission and purpose of CMC Vellore.